In 150 AC King of Pergamon, Attalo II, He ordered his men they found heaven on earth. The beauty of Antalya so impressed his envoys there was founded Attalia and became the basis of a powerful naval fleet of the king. 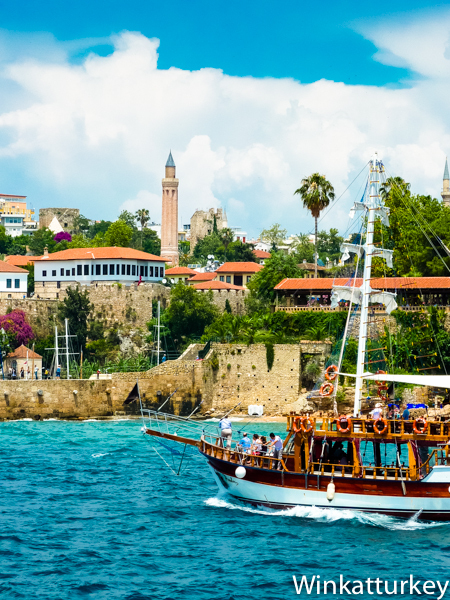 With the passage of time, Antalya became part of the Roman empire, Byzantine and Turkish and was always a multicultural place, with major Jewish and Christian communities. Today the city is one of the largest in Turkey, with over one million inhabitants and its province comprises a wide territory from Patara, west, to beyond Alanya, in this. Of course, is the tourist capital of southern Turkey and its airport receives more than 10 million passengers a year. However, many of them are taken directly to their resorts, where model all inclusive lets just see tourists visiting the old part of the city, known Kaleiçi. The area is subject to strict guidelines for conservation and as a result can enjoy low houses, narrow streets, shopping and entertainment. There is also an interesting choice of luxury hotels that are part of the old town and from which we can organize our visits to the city and surrounding. The structure of the city is curious, This part is on a cliff 30 meters landlocked. Continuing west, find the old part and then, the park that leads to the spectacular beach of Konyaalti, with over 7 kilometer. In the city center we can not miss the minaret Yivli, symbol of the city and built between the thirteenth and fourteenth centuries by the Seljuk, measured 38 meters and shaped fluted. All around we found a crowded bazaar, although there beware prices, because the purchasing power of some tourists has exploded the pretensions of savvy traders. Nearby is the clock tower, one of the usual sights in all Turkish cities. In one of the entries to find the old Hadrian's Gate, a beautiful triumphal arch built to commemorate the visit of the emperor to the city in 130. It is in very good condition. A walk through the streets of Kaleici lead us to another of the monuments that appear on all guides, Truncated Minaret (Broken Minaret). The building next to it is started as a Roman temple, later became a church to go to become mosque. A fire in the nineteenth century destroyed the building and left the minaret in its current state. In the place where the walls reach the cliff by the east, Torre is the Hidirlik. It is a circular building built by the Romans overlooking the historic harbor and has been used as a fortress and lighthouse along the centuries. From there we can see the bay and part of the city. A new walk will take us to the port descending steep streets full of shops and restaurants. In the harbor we found the boats to Duden Falls, the tour lasts about two hours and allow us to see the sea from the cliffs of the eastern part of the city. Some hotels located on the very edge of the cut, have elevators that allow guests down to platforms built on the rocks where you can sunbathe and also reach the sea by ladders. Finally, the Duden Falls is reached, a waterfall that falls directly into the Mediterranean for over thirty meters and flow quite. If we have chosen to stay in boutique hotels in the old town, we can enjoy the vibrant nightlife and from there we will be in an excellent position to visit the famous around Antalya, from the beach to Olympos City Side or dramatic theater Aspendos, scene of a major program of performances and concerts throughout the summer. Chicossss… where I lived ago 7 years ago, hoy justo me levante con “Antalya memories” jajajaja.. I loved the city, Side also, Aspendos, The Playa de Lara y Konyalti.. Fascinating and return tourist, now need to convince my husband… A hug from Argentina !!! Go luck to have lived in such a nice place. I hope you can return soon. A hug.